A really common question, of new or less new Grasshopper3d users, is why the 3rd party add-ons they’re trying to install are not appearing on the ribbon layout of the canvas. In the, not at all exaggerated, 99% of the cases, the issue lies in the fact that these files are “blocked” by windows. You can briefly learn more about why windows block some files, especially downloaded from the web, here. The common solution to this to prompt the user to right-click on the blocked .gha or .dll file, open the properties tab and click the unblock option on the bottom right corner of the properties window. Something that is efficient, but can take ages, if you don’t know which file is blocked, or have to unblock many files at the same time. It also saves some people (GH forum users) the trouble explaining or troubleshooting the same scenario every single time. 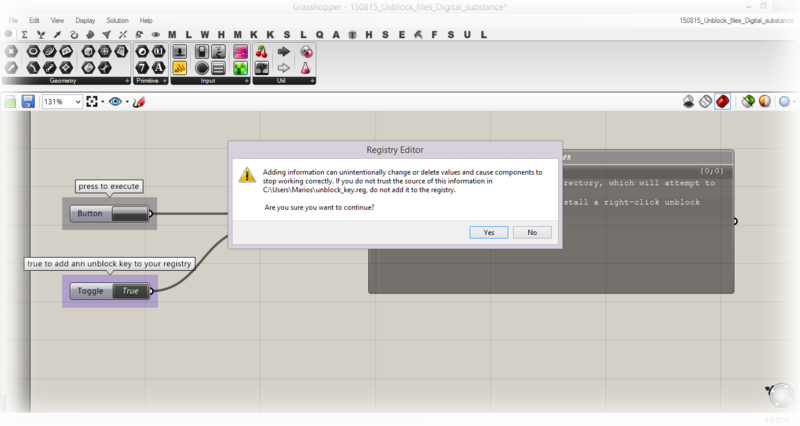 So, by just clicking on the button toggle of this Grasshopper3d definition and executing the script you automatically unblock all the files in your local GH libraries directory. 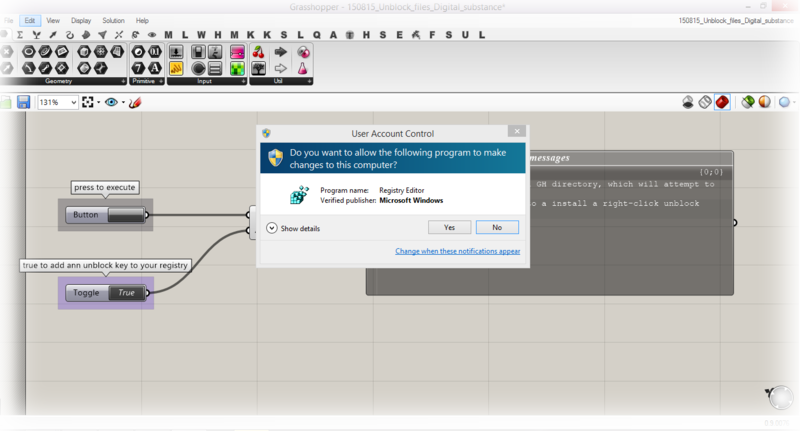 This ensures that when you restart Grasshopper, all the add-ons in this folder will be loaded onto the ribbon tab. 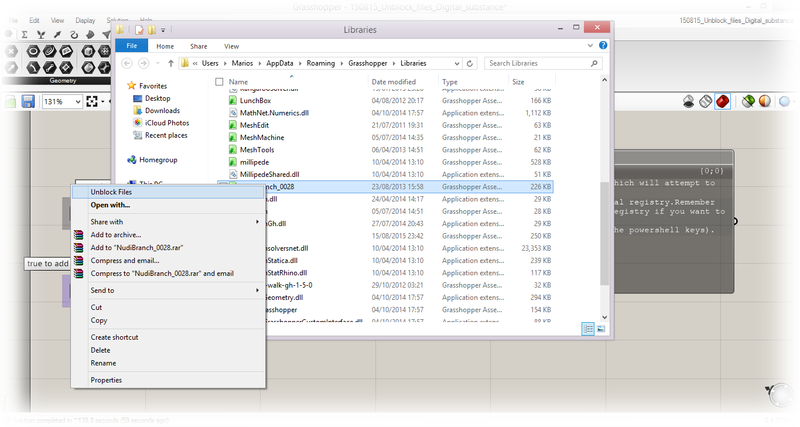 I also added an extra option that will install a special key to your registry, so that an complementary option of unblocking files is going to appear on the dropdown right – click menu. This of course means that you can select multiple files and unblock the simultaneously. Info on how to get rid of this extra option is provided while running the component. As you may have guessed, adding new keys to your registry relies heavily on your admin rights. Following is a simple illustrated breakdown of the process. If your IT department has block your admin privileges don’t expect this to work. However it has been tested successfully on personal pc’s, on Windows 7, 8.1 and 10. Special thanks to Angel, Mateusz, Michael, Stamatis and Andrea for beta testing. I will upload the c# code on my github account. So any takes and tweaks are more than welcome. Beware that this code might not be bug free (most probably is full of bugs) and I do not take any responsibility if you destroy your computer. You can grab the def and an extra GH user object to keep this snippet constantly in your GH toolbox here. Long time no see. Been very busy in the last couple of months…:( However I am particularly happy about this post. For the past month I had the chance to work on something that has been on my mind at least two years now. 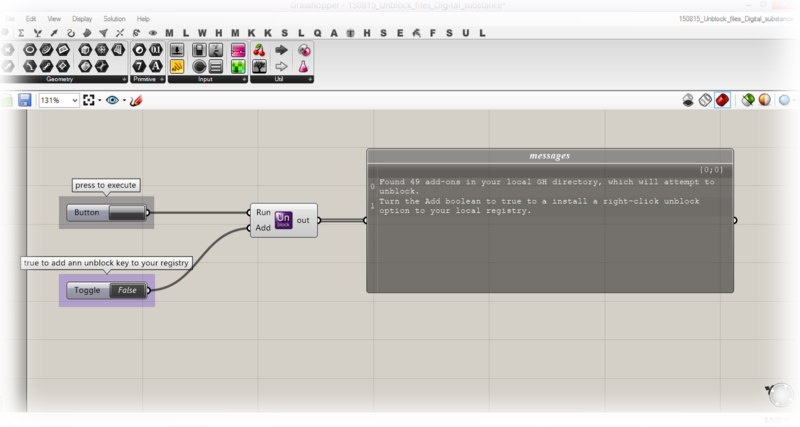 And finally the time has come when I manage to publicly release Nudibranch a new Add-on for Grasshopper3d. What is a Nudibranch????????? Specifically Glaucus Atlanticus.. The Nudibrach Add-in for Grasshopper3d is a set of components facilitating and automating Grasshopper’s capacity to generate distance-based value fields, in addition to moving particles through attractor defined vector-fields while creating animated simulations of these particles. In particular, Nudibranch aims to automate the attractor development process (one or multiple), while covering most of the frequently used cases, without however intending to replace or render useless the basic understanding of how attractors operate. Furthermore, three animation components enable the real-time interaction between attractors and the affected data. Since this is the first release of Nudibranch and it might still contain bugs. Please use it “as is”, it does not come with warranties. Please give credit where credit is due according to the license file. You can download Nudibranch from the Food4Rhino website, along with other useful plug-ins. 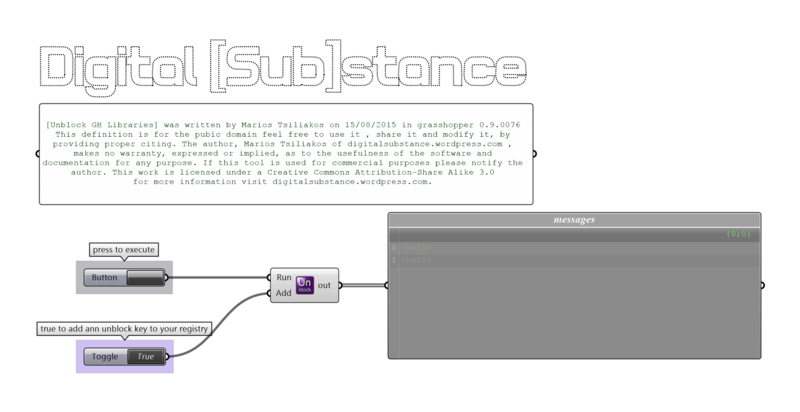 A brief documentation and generic examples are also included in the download folder. I plan to share my experiments with Nudibranch through this blog and via the Grasshopper community group. If you create an interesting design, or even better if you want to share some feedback and your thoughts on Nudibranch just drop a line. It will be really appreciated. Nudibranch Copyright (C) 2013 by Marios Tsiliakos is licensed under a Creative Commons Attribution-NonCommercial-NoDerivs 3.0 Unported License. Permissions beyond the scope of this license may be available at www.digitalsubstance.wordpress.com.